Beautiful Ranch plan overlooking the park. 5 bed, 3 bath, 3 car garage home featuring an upgraded kitchen with quartz countertops, 42" cabinets and upgraded backsplash. Even the small details like USB outlets have been added! Hardwood floors in the main living areas and tile in the bathrooms and laundry. A spacious living area has a custom 9' by 5' Pella Window showcasing the amazing Open Space, Natural Bluffs and Park views. The Master bedroom is spacious and has a huge Picture Window overlooking the open space along with a 5-piece bath and a large walk-in closet. The finished basement offers a abundant additional space. With 2 bedrooms, a full bath and a large great room, it's the ideal location for guests or family get together. The 3-car garage is wide, deep with plenty of storage. 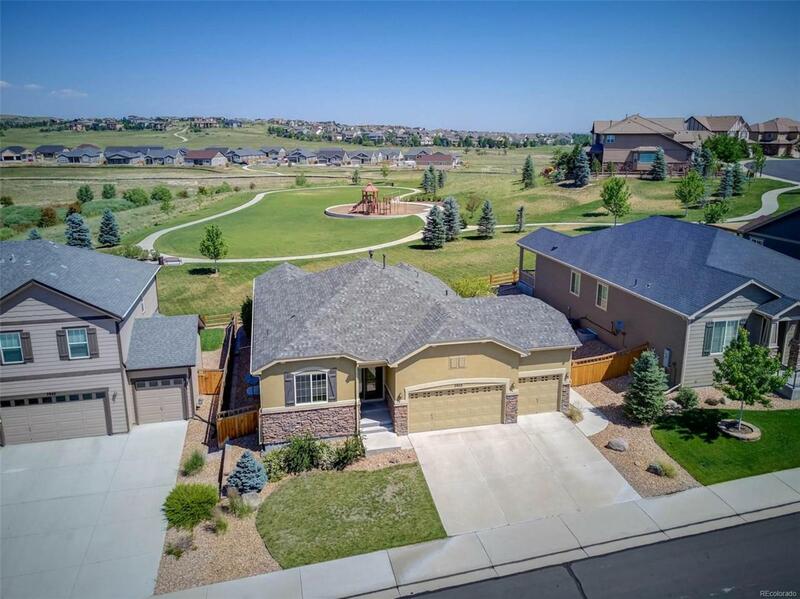 Cobblestone Ranch has amenities including a private pool, play parks, miles of trails and access to Cherry Creek Trail and Hidden Mesa Open Space.